After a very successful competition last year, Benny the Boot is back for 2015. And all city national schools are asked to get creative about how their pupils travel to and from school. An Taisce Green-Schools in partnership with Galway City Council re-launched the citywide active travel competition this week at Woodquay. Mayor Donal Lyons kicked off the competition with Tiarnan McCusker from An Taisce Green-schools Programme, Helena Martyn, Galway City Council; Teacher Siobhan Morahan and pupils from Scoil An LinbH Iosa, Francis Street. 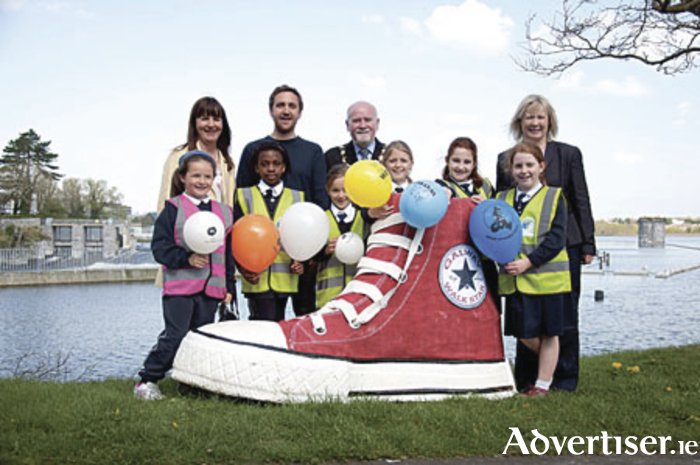 The competition culminates on the Friday of An Taisce’s National Walk to School Week (May 11-15 ) and will see a Galway City national school win Benny the Boot, a Mayoral visit and a €500 prize for cycle training from Galway City Council. The winning school will have achieved the highest increase in walking, cycling, scooting and park and striding numbers between now and Friday May 15. ‘Last year, the ten schools taking part achieved on average a whopping 25 per cent increase in active travel modes to school.’ said Tiarnan McCusker, Green-Schools Travel Officer for Galway City,” This year we are hoping to get more schools involved and achieve an even greater modal shift. Active school travel has proven benefits to a child’s capacity to learn at school. It has also been shown that young people engaged in active travel are likely to be more active in other areas of their lives and therefore less prone to problematic weight issues. There are also significant environmental and social benefits to active travel such as cleaner air, happier people and stronger communities. Green-Schools Travel have been working in cooperation with Galway City Council since 2008 to increase the number of school journeys taken by Green Travel modes. These include walking, scooting, cycling, park and striding, car pooling and using the bus.